During my recent blogging hiatus, I spent some time thinking about the pro's and con's of why I blog which lead me to question some of the things I was doing. I found that there were some ridiculous things that were stressing me out unnecessarily. After turning these into a list I thought I'd put a bit of a light hearted spin on them so I can look back from time to time to remind myself not to get into funk again. 1. Thou shall not get engrossed by awards ceremonies, thou will never be nominated for, let alone win! 10. Thou shall remember that this is a hobby and that family and work come before it! First, there are so many I agree with here! But, I wish more bloggers would share their pageviews, expecially when building. I am stuck at 3.000-4,500 a month, there, I said it. I need so much more to do sponsored ops and I am struggling with feeling inadequate. I wish more bloggers would talk about this! If and when I make it over the hump I will write about it, without bragging! LOL I think it would help so many of us! #4 is one I continually have to check myself on, I was doing 45 linkups a month and killing myself. I hardly had time to sleep let alone write a cohesive post! 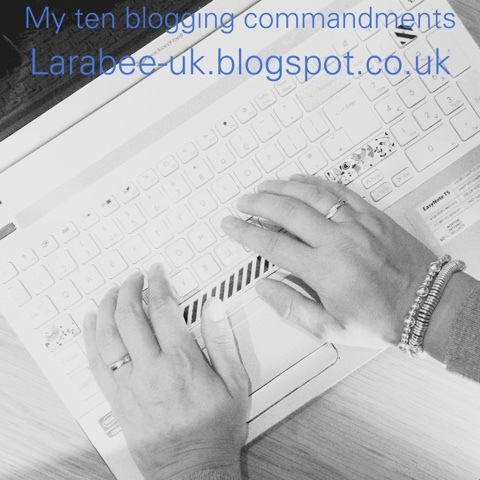 HIya lovely, I need these commandments too! Although I didn't understand what a DA was, can you enlighten me? Regarding pageviews, I thought it was views or unique views that count. For the record I get between 25,000 (I didn't blog at all in August!!) and 50,000 a month. I've no idea how I get that but I guess my google traffic is quite good (so SEO) and also I've been doing it for 4 years in January, which makes google like you more and send more traffic your way. I often have to remind myself that I blog for a hobby and that I shouldn't get obsessed so very good tips indeed.